Hauskaa lauantaita, tervetuloa viikon Allsorts haasteen pariin! "Kissoja ja koiria" on kiva aihe seuraavaksi. Kiitokset viime viikon haasteeseeni osallistuneille. Hi; Happy Saturday, it's time for a new Allsorts Challenge! Thank you for your creations for my "new" theme last week, so many beautiful entries. Now it's sweet Susan's theme "Cats and / or Dogs". I'm sure we'll have a fabulous week! Our sponsors are Sizzix and Digistamp Boutique. DT Card Info: Stamp: Penny Black; Mediums: Versafine black ink and clear embossing powder; Zig CCRB watercolour markers; Sakura Identi pen. 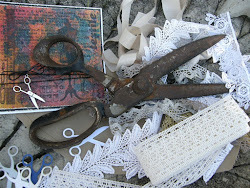 Diecuts: Simon Says Stamps stitched retangles, Mama Elephant's banner, handwritten text! 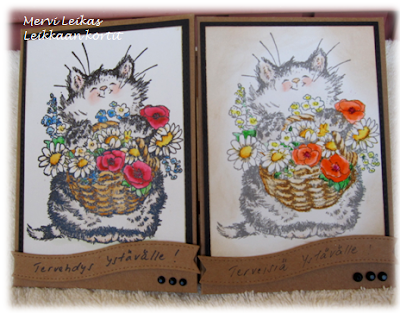 Such a lovely card Mervi and the sweet PB image is just perfect for this weeks theme. 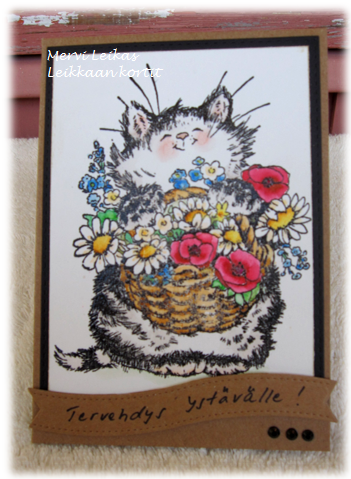 Gorgeous card, Mervi I Di love that PB stamp, thanks too fur your encouragement on my blog. Sweet cat, perfect for many occasions. Hm, not sure which one is my favorite. I quite like how different they look stamped with different inks. This is perfect for our current challenge “Use an Animal Image” at Pattie’s Creations. Your image is sooo cute!!! Thanks for joining us! Great image and both colour ways look brilliant agains the black and kraft card, really lovely cards. Such a cute card, thank you for sharing it at Penny's Paper Crafty Challenge. Such a sweet card! So glad you've joined us at Penny's Challenges. Hope to see you again! Thanks for joining us at Penny's Paper Crafty Challenge! Hope to see you back again soon!